In an announcement made on Tuesday morning, UBC has instituted a new scholarship endowment which focuses on women's athletics: the Blue and Gold Women's Varsity Endowment Fund. The fund — currently seeded by a $30,000 anonymous gift — is part of the Blue and Gold campaign announced in November 2017 by President Santa Ono. In a speech made in front of T-Bird athletes, coaches, staff, donors and supporters at the 2018 ZLC Millennium Scholarship Breakfast, Ono pointed to a need to close the gender gap within the sports scholarship landscape at UBC. Though female student athletes are currently supported by the Twenty-8 group, a leadership group for funding women in varsity sport on campus, the new Blue and Gold Women's Varsity Endowment Fund will provide further support for the women's teams. For the 2018 fiscal year, women's varsity programs received $563,669 in scholarship funding — $150,591 less than their men's counterparts who had $714,260. Neither number includes football — which received $246,806 — due to the fact that it has no women's equivalent sport. Similarly, the more individual sports like cross country are a separate classification, with $167, 129 allotted for scholarships. These totals encompass funding from endowments and one-time donations, UBC Athletics and the Leadership Fund, UBC funded scholarships — like those created through Millennium Breakfast matching — and government funding. Discrepancies between the scholarship funding for men's and women's athletics was primarily in the donor category. 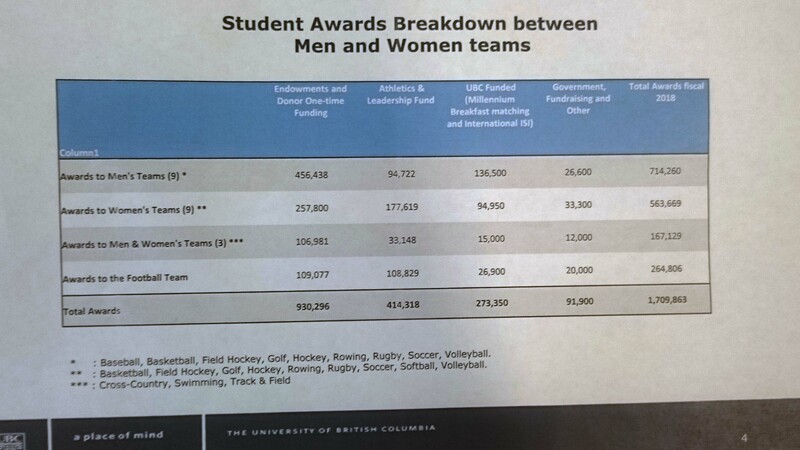 As shown within the figures provided by UBC Athletics, men's teams received almost $200,000 more in scholarship funding from donors and endowments than women's teams. Though UBC Athletics has been working to even out the numbers with their own scholarship funding allocation, the new endowment fund hopes to help close that gap even further. 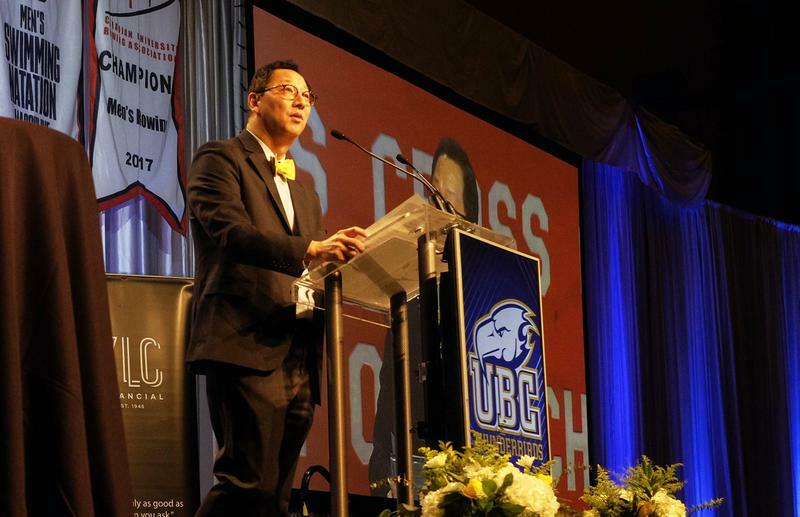 Going forward, UBC has guaranteed it will match up to $100,000 worth of donations to grow the Women's Varsity Endowment Fund, with the possibility to expand that dollar-for-dollar plan should the current strategy “do very very well,” as Ono stated. The women's field hockey team has already raised $8,000 for the fund— a healthy start to a new, women's focused campaign.